Duplicator Supply Co Inc., (DSC) established in 1949, is one of the oldest business equipment companies in the Chattanooga, Tennessee area. DSC is an AUTHORIZED DEALER for the Kyocera and Standard product lines. 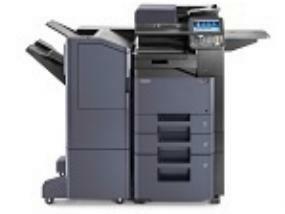 We support Digital Copiers, Facsimiles, Printers, Digital Multifunction Products, Duplicators, Folders and Shredders. We also support finishing solutions. DSC is known for outstanding customer service and we are dedicated to meeting our customers' needs. The Service Department at DSC is known for providing the finest service available. This is a primary reason our customers continue to do business with us year after year. Our Service Technicians are factory trained and receive continued education that allows them to maintain our state of the art Service Department. We are dedicated to providing each customer with excellent service. Our Sales Representatives have undergone extensive training, which enables them to analyze customer needs and develop an appropriate, affordable solution. Our Sales Representatives specialize in "on site" training to ensure your employees are properly trained to utilize the equipment to its utmost capacity. We at Duplicator Supply Co Inc., understand the importance of reliable equipment and quality service. We feel that our reputation for incomparable service and support; and excellent quality of the Kyocera and Standard products, backed by Duplicator Supply Co Inc., will give you the "peace of mind" that you are receiving the optimum quality and service you deserve.